The Kurdistan Regional Government is in the process of increasing the capacity of the pipeline running to the Turkish port of Ceyhan from 120,000 to 300,000 barrels a day, according to KRG sources. Turkey's Energy Minister Taner Yıldız said on Monday that there is a temporary suspension of oil deliveries from the Kurdistan Regional Government's (KRG) oil pipeline via Turkey due to maintenance work. However, according to sources the KRG suspension is due to ongoing work to increase capacity that is expected to finish in two weeks' time. 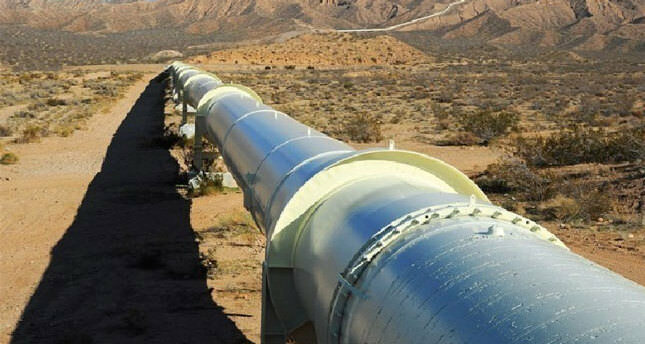 Last December the KRG administration completed the construction of the Taq Taq-Khurmala-Fish Khabur pipeline that connects the Taq Taq oil field to the entry point for the Kirkuk-Ceyhan pipeline. Despite the threat from the Islamic State of Iraq and al-Sham (ISIS), the oil flow from the KRG region to Ceyhan has continued with around 120,000 barrels without interruption. However, KRG sources said that planned capacity of 300.000-barrel of oil export by July, could not achieved due to the ongoing ISIS threat. "[Nevertheless] Capacity increase works are currently continuing and are expected to be completed by September. When works are finished we will be able to export 300,000 barrels on a daily basis via Ceyhan," another KRG official told Daily Sabah. KRG Energy Minister Ashti Hawrami announced in June that a link between the Kirkuk oilfields and the KRG's recently-built pipeline to Turkey were completed. The pipeline connects the Kirkuk Avana dome to the Khurmala dome from which the Kurdish pipeline runs. However, Kurdish official declined to comment regarding the question about the capacity increase of the pipeline due to controversial Kirkuk oil. KRG oil exports from the port of Ceyhan began on May 23 and so far almost 6.5 million barrels of crude oil have been loaded onto seven tankers. Despite the U.S. and Baghdad's international pressure, the KRG has managed to sell around 2 million barrels of crude oil so far. Even though officials from the Turkish Ministry of Energy declined to comment about the payment details, industry sources believe that the payment for the second tanker was about $ 100 million (TL 216.43 million), which is estimated to be collected by Turkey's state-run Halkbank. Minister of Energy Yıldız announced on June 23 that the first payment, totalling $93 million, was deposited to Halkbank. The KRG's total production capacity is currently slightly more than 400,000 barrels per day and it plans to increase this amount to 1 million by 2015 and 2 million by 2019. The KRG controls an estimated 40 billion to 45 billion barrels of oil as well as 6 trillion to 7 trillion cubic feet of natural gas reserves with an estimated combined worth of $5 trillion.